HOPE Circle groups provide support for pregnant & postpartum moms. 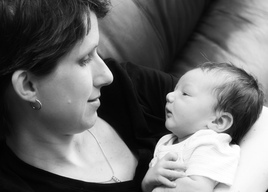 Photo via Creative Commons, Flickr user: Jill M.
Emotional changes & challenges during pregnancy and the postpartum period are common. Moms can experience a range of emotions from feeling isolated, lonely or overwhelmed to experiencing anxiety and depression after baby arrives. These pregnancy/postpartum challenges can affect the whole family. Women should not have to go through this alone! It can help to share in a safe, supportive group environment. This group is for any mom experiencing any kind of emotional or adjustment challenges during pregnancy or postpartum (up to 12 months post birth): stress, exhaustion, feeling isolated or lonely, anxiety, or depression (adoption/birth/foster). "Went to Kitsap Hope Circle tonight. What a peaceful, healing time. Like a place for a mom to recharge her batteries. Such a needed time of rest for moms!"